Brassé BBQ earns smooth points! Sizzlin’ thighs. Hot buns. A perfect rack….to grill on. Things have really started to heat up around here – ever since the Brassé BBQ was featured in Smooth Magazine (Issue #57 September 2012). Smooth, a bimonthly magazine, is self-described as ‘the hottest men’s magazine on the planet’ – and with good cause. They showcase all things guy-related from cars, to stars, to gadgets and tech, all topped off with a healthy helping of red-hot Smooth Girls with plenty of curves in all the right places. Funnily enough, we didn’t even know that Smooth had featured the grill until someone contacted us and referenced the article. Obviously, we jumped at the opportunity to grab a back issue. A week later Issue #57 arrived – discreetly wrapped in brown paper – and we were happy to find the Brassé BBQ on the ‘The Hot List’, page 17. Which means a lot seeing as we’re up against such smokin’ competition. Smooth Magazine is published by Sandra Vasceannie and has featured prominent figures as Trey Songz, Coco, and 50 Cent. They operate out of New York. The Brassé BBQ brings the tasty goodness of outdoor grilling the condo-bound or those who don’t love the idea of cooking in 4 feet of snow come winter. 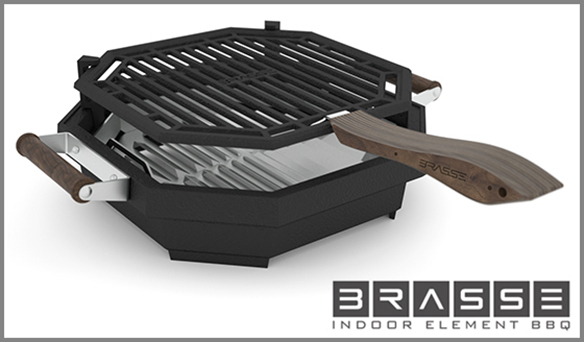 It uses lava rocks heated by your gas or electric stove element to grill your meaty eats. The BBQ comes with adjustable grill heights for cooking versatility, a grease trap, and a detachable handle. For more details, including how to order, check out the Brasse BBQ on ideacious. This entry was posted in Blog, Magazine, Print Publication and tagged appliance, Barbecue, Barbecue grill, Cook, cooking, eating, Grill, indoor, kitchen, meat, munchies, Outdoors, portable by igopaolo. Bookmark the permalink.